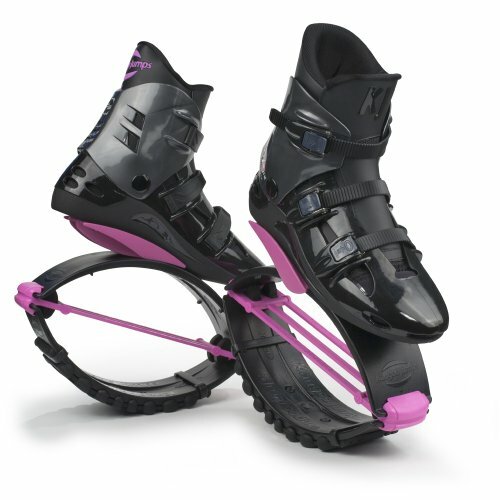 Since the invention of jump shoes, great strides have been made in their quality and technology. If you remember the original flimsy jump pads that were made to be attached to regular shoes, you know that they weren’t all that fun, and they weren’t really that safe. Now, more than half a century later, today’s jump shoes look nothing like the original version. The perfected version looks a lot more like a roller skate on a stable platform, designed to hold your feet in and provide a maximum bounce. We’ve listed 10 below but here is our top 3! Adults often use them for athletic training. 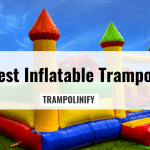 They’re an excellent way to get fit, and to practice for athletic competitions. 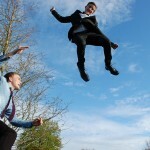 They also have the added benefit of being a lot of fun, and there’s no such thing as growing out of simple pleasures. 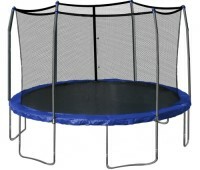 Children will get the health benefits that come along with a more active lifestyle, and they’ll have fun bouncing. Everyone can use a pair of bounce shoes, but it’s hard to tell which ones are truly the best. On the surface, they seem like they exist mostly for fun, but there are some things hiding below the surface. Many people actually purchase jump shoes for medical reasons. As strange as it may sound, individuals who have issues with chronic back and leg pain find that jumping shoes alleviate some of that tension. This makes them excellent shoes to wear while exercising, as they make physical activity comfortable for people who have a hard time getting around. Athletes find jumping shoes valuable because of the way they allow them to train. In sports that involve a lot of running or jumping, such as basketball, there are core areas of the leg that need strengthening if the ultimate desire is to improve the athlete’s ability. Jumping shoes, or jumping boots, allow focused intensity training by providing a slight boost. Once the muscles are strengthened and stamina is increased, athletes will see a performance boost over their typical performance when they aren’t wearing the jump shoes. Children have a lot to benefit from jump shoes as well. Childhood obesity is on the rise because of increased access to easy entertainment. 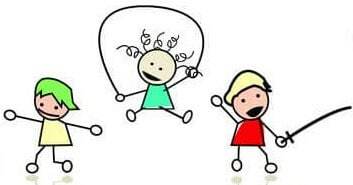 Television, computers, smartphones, and tablets all provide children stimulation that doesn’t involve physical activity. Getting a pair of jump shoes for your child will encourage them to move around a little more. 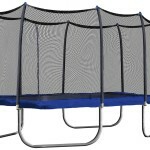 They’re fun, safe, and a much healthier alternative to sitting around indoors all day. Jumping shoes are certainly different from regular shoes, and it’s a difference you’ll notice immediately. While it’s easy to find your center of gravity in regular sneakers, the construction of a jump shoe makes this task a little more like a balancing act. In some ways, it’s similar roller skates or ice skates, but your relationship with the ground is much different. Obviously, you’re going to have an added bounce in your step with regular walking. Before you start using them intensely, get used to walking around. You’ll develop a feel for how gravity and your weight feel with a bounce in your step, and get used to balancing with the shoes. Slowly build up intensity. Don’t put them on and go crazy. Slow and steady wins the race, and taking the time to get used to the feel of your jumping shoes can help you master their usage while keeping you safe. There’s been a lot of concern surrounding the safety of novelty footwear throughout the years. The original bounce shoes weren’t nearly as safe as today’s jump shoes. Heelys, or skate shoes, were often in the news for a lot of injuries due to malfunctions in the shoes or users misunderstanding the instructions for safe usage. Fortunately, jump shoes have been subject to far more thorough testing. Their current design aims to redistribute weight in a way that will work with your natural balance. Rather than losing your center of gravity, jumping shoes and jumping boots will simply narrow it down to one place. This means you’re less likely to trip if you’re good at other balance based activities, like skating or riding a bike. You should always use good common sense, wear protective pads and gear, and only wear jumping shoes on dry, stable, even terrain for your safety. If you’re ready to get a pair of jump shoes for yourself or someone else, you may not know what you should be looking for in a jumping shoe. We’ve explored the web and found the top ten shoes with the best ratings, reviews, and customer testimonials. 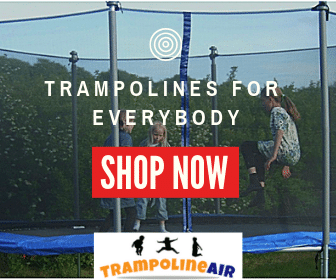 Below is a list of the best jumping shoes for both adults and children. 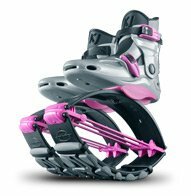 Kangoo jump shoes and jump boots are one of the most recognizable brands on the market. While they’re a little more on the pricey side, You’re definitely paying for quality. Kangoo keeps your child’s safety in mind, and the result is a durable jump shoe that’s meant to handle the abuse that a child may inflict on it. 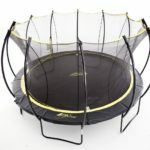 A common sentiment among reviewers who purchased these for their children is that they’re interested in buying a pair for themselves after seeing how much the kids enjoy them. This particular model is a jump boot, so it is intended to be worn over properly fitted athletic footwear. The unique thing about the G-Max brand is what’s going on inside the jumper piece. To reduce the impact of exercise, these boots have a shock absorbing ball inside. If you have any issues with your joints or chronic pain, these are the best choice for you. They also come with reflectors on the back for safer usage at night time. The only concern reviewers seem to have is that the shoes pinch a little bit if they aren’t properly adjusted. 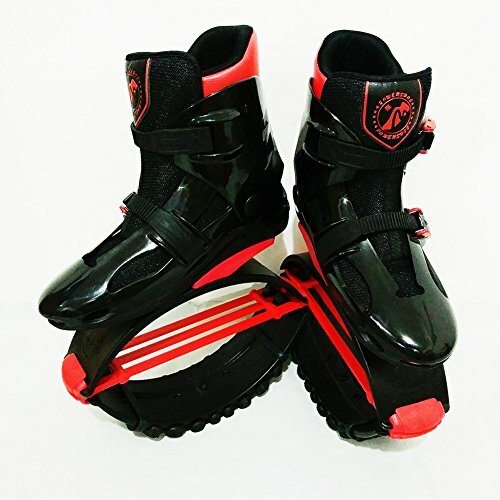 The manufacturer provides a mechanism for adjusting the shoe, and a customized fit can be achieved by using an ordinary coin as an adjustment key. Even with this small gripe, reviewers are amazed at what these jumping boots do to relieve exercise related knee tension. These are similar to the previous boots, but they’re designed for children. There’s some subtle differences in the adult and children’s models of the G-Max Boots. These are also the same boot construction that need to be worn with comfortable footwear. Another major difference in the design is that the children’s version doesn’t come with the shock absorbing ball. Most children generally have healthy joints, so that probably won’t be a major concern in your purchasing decision. This particular model of jump shoe comes with pink accents, making it a stylish choice for a fashionable woman. 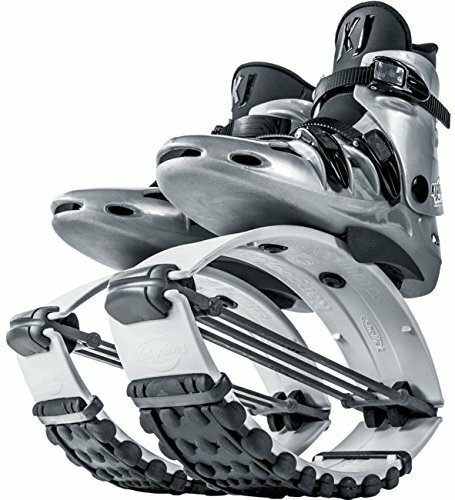 Kangoo are industry leaders, and they pride themselves on the functions built into the boots. 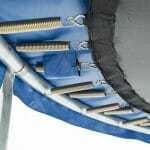 Depending on how you want to jump and rebound, you’re able to modify the t-springs of the boot, or add a coil spring. This opens up a world of options, as you’re able to modify your jump shoes to suit a variety of different needs. If you get them and you don’t like how they work right out of the box, you can make them adapt to your personal preferences. The main difference between the XR3 model and the KJ-XR3 model is the thickness of the shell. This particular jump shoe has a slightly harder shell. This is both a blessing and a curse. The harder shell makes for a durable shoe that you’ll ultimately be able to enjoy for longer, but that doesn’t come without a price. This means the boot will be heavier to wear. If you’ve already jogged with ankle weights to condition yourself for running, you won’t likely notice a difference between this model and other lightweight models. Another perk to all black boots that might not be so obvious is that they will look newer for longer. If you’re using these outside, they won’t look dirty as fast, and any cosmetic damage will blend in. These are regarded as the holy grail of all jumping shoes. Though the price tag may give you sticker shock, these are one of Kangoo’s premium offerings, and they deliver on the results. Designed to absorb up to 80% of the joint impact when used while running, these jump boots will make you feel as though you’re walking on air. The shoe itself does weigh five pounds, so it may take some getting used to. Once you’ve adapted to them, you’ll find that you’ve immediately begun to gain strength in your lower leg muscles, and that will only make your future athletic activities a little easier. These are an excellent way to get fit and tone your calves, and may help in the long term with any health and strength related issues you may experience. These shoes are a novel idea. 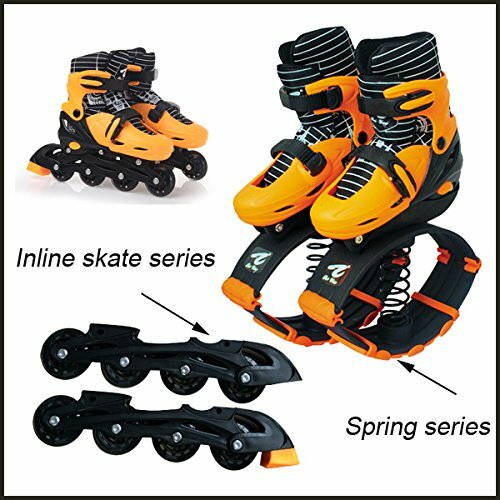 While many jumping boots are designed purely for bouncing and shock absorbency, these have the added benefit of being converted to rollerblades. 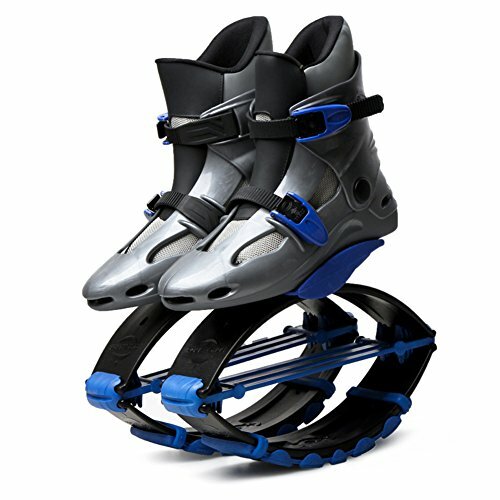 The jump mechanism is very typical of most jump shoes, with the main difference being the inclusion of a tension spring. This makes for a heartier bounce, and a greater rebound. 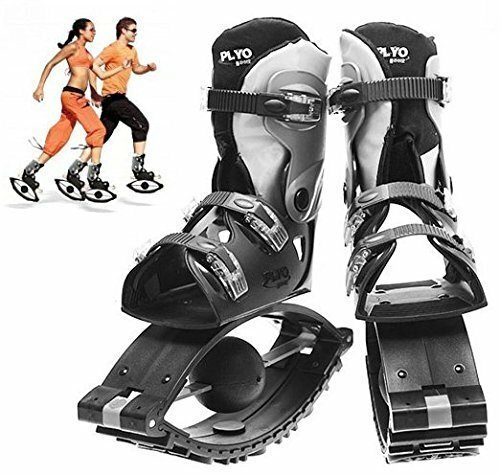 If you ever feel so inclined, you can attach the rollerblade pieces and use the boots as skates. It’s a two for one deal, and an excellent value. 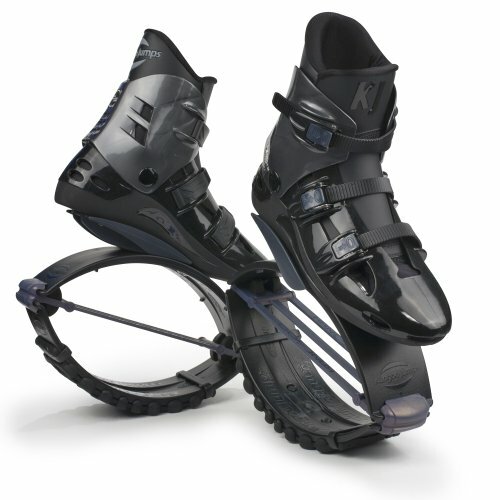 These are a thriftier alternative to higher end brand jumping shoes, such as those made by Kangoo. They’re excellent if you don’t think you’ll use them enough to warrant the investment. While they’re perfectly safe, they aren’t as durable. If you plan on using them a lot, you’ll find that you have to replace them sooner than you may want to. If you only want jumping boots for occasional recreational use, these hit the mark with their sweet spot between price and quality. These are essentially another generic brand, but they’re trying to innovate less expensive alternatives. These shoes are wider and ergonomic, excellent if you have wide or flat feet. Jumping boots tend to be narrow, because they need to be form fitting on order to assure maximum safety. 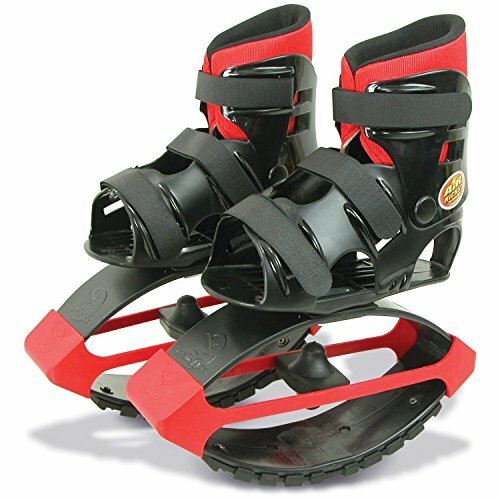 If you find Kangoo or G-Max boots a little uncomfortable around the heel or the toe, you might want to consider going for jumping boots like these, that are designed to accommodate a foot that isn’t standard size. These have a unique design, and they’re worth checking out. 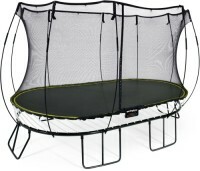 Air Kicks has patented their jumping mechanism, which they call Jumping Jax T-Spring Technology. 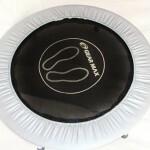 Unlike most jumping shoes, these have the bands around the outer portion of the jump pad, and a t-shaped mechanism in the middle to control and regulate rebound. One of the coolest features of this boot is that the manufacturer sells custom replacement t-springs individually. If you lose weight, gain weight, let someone else borrow the shoes, or wear down the original springs over time, there’s no need to go out and by a whole new pair if the shell and the jumping mechanism are still in good condition. 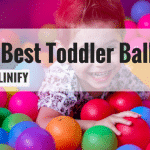 With jumping boots, it’s not as simple as a generalized recommendation. 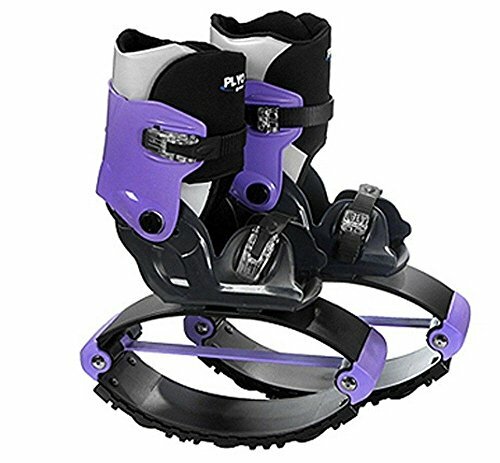 There are jump shoes for children, and jump shoes for adults. Certain shoes have different weight limits, and may need adjustments to work for some people. 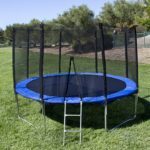 Different jump mechanisms handle rebound in different ways, and it comes down to whether you intend on using them for fun or for serious exercise. Always read the specifications before purchasing to make sure you’re getting the right jump shoe for you, and don’t forget to properly care for your jump boots to ensure their longevity. 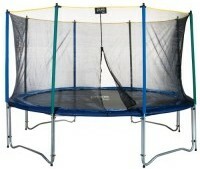 Trampolines vs. Rebounders What’s the Difference?